• Twenty-five percent of applicants inquiring about rentals in non-pet-friendly housing are seeking pet-friendly rentals. With such a sizable potential tenant pool it seems there should be enough pet-friendly housing to meet demand. According to economic theory, in perfectly functioning markets (where people make rational, profit-maximizing decisions, with full information and no significant transaction costs) pet-friendly housing should always be available to renters willing to pay a premium to cover any extra costs to landlords. Why then do so many landlords overlook opportunities to increase profits by providing pet-friendly housing? With nearly 70 percent of American households having companion animals and over half of renters who do not have a pet wanting one, why are so few pet-friendly rental units available? The report found that among landlords who do not allow pets, damage was the greatest concern (64.7 percent), followed by noise (52.9 percent), complaints/tenant conflicts (41.2 percent) and insurance issues (41.2 percent). Concerns about people leaving their pet or not cleaning common areas were rarely cited (5.9 percent). Although 85 percent of landlords permitting pets reported pet-related damage at some time, the worst damage averaged only $430. This is less than the typical rent or pet deposit. In most cases, landlords could simply subtract the damage from a pet deposit and experience no real loss. In fact, the report finds landlords experience no substantive loss. There is little, if any, difference in damage between tenants with and without pets. Other pet-related issues (e.g., noise, tenant conflicts concerning animals or common area upkeep) required slightly less than one hour per year of landlord time. This is less time than landlords spend for child-related problems and other issues. Whatever time landlords spend addressing pet-related problems is offset by spending less marketing time on pet-friendly units by a margin of 8 hours per unit. The study found problems arising from allowing pets to be minimal; and benefits outweigh the problems. Landlords stand to profit from allowing pets because, on average, tenants with pets are willing and able to pay more for the ability to live with their pets. Many municipal shelters receive many wonderful pets because of this unnecessary housing shortage. Imagine if all landlords permitted pets. That would create a demand far greater than the number of pets dying in our shelters, allowing our community to maintain its status among the safest communities in the United States for pets. Unfortunately, too many landlords overlook the opportunity to increase revenue, tenant pools and market size by allowing pets. While the benefits to landlords are easily quantified in a profit/loss statement, the benefit to our community’s homeless pets is incalculable. Landlords can make a profitable, life-saving choice by simply permitting pets. In July 2010, the Yavapai Humane Society (YHS) implemented a “no-kill” ethic. YHS applies this “ethic” by using the same criteria for deciding a homeless animal’s fate that a loving pet owner or conscientious veterinarian would apply. That is, healthy and treatable animals are not killed simply because we lack the room or resources to care for them. The “no-kill” ethic embodies our commitment that for every animal who comes through YHS’ doors there is a kind and loving person or family – and it is our mission to bring them together. The Live Release Rate (LRR) refers to the number of animals who get out of a shelter alive. It includes adoptions, transfers to rescue organizations, and lost pets returned to owners. Some shelter experts claim a 90 percent LRR is the threshold to “no-kill.” Since July 2010, YHS has maintained a 91 percent LRR (and a 95 percent LLR in 2012 and a 97 percent LLR in 2013 YTD). The Euthanasia Rate reports the actual number of animals euthanized. In the first year implementing the no-kill ethic, YHS achieved a 63 percent reduction in killing, followed by a 64 percent reduction in year two, and a 40 percent reduction in year three; for an overall reduction of 92 percent over the past three years. This translates into four additional lives saved every day of the year. The Per Capita Kill Rate refers to the number of animals killed per 1,000 residents. 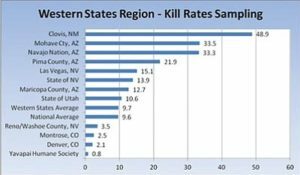 Prior to implementing the no-kill ethic, YHS was killing 17.25 animals per 1,000 residents; one of the worst kill rates in the state. However, in the 12 months ending June 30, the YHS kill rate was 0.8; the lowest in the nation! This rate is calculated by using the 2010 U.S. Census population estimate for central and western Yavapai County of 154,482 (131 animals killed / 154 = 0.8). There are many ways everyone can help maintain our status as the safest community in the United States. 1. Spay/neuter your pets: Pets should be spay/neutered before sexual maturity. Call the YHS Spay/Neuter Clinic (771-0547) to make an appointment today! 2. Microchip your pets: YHS has one of the highest “Return to Owner” rates in the nation (50 percent). When your pet comes to YHS with an up-to-date microchip, he has a guaranteed ticket home. For a limited time, microchips can be purchased for just $15 at the YHS Spay/Neuter & Wellness Clinic any Friday without an appointment (2989 Centerpointe East, Prescott). For an additional $9.95, you can register your pet for life! 3. Support YHS by becoming a PAWS (Planned Automatic Withdrawal Service) donor. By joining PAWS, an automatic monthly donation of your choice comes to YHS without the hassle of sending in a check. Each month our secure system automatically processes your donation. You choose an amount that feels comfortable and you can change or cancel your participation at any time. 4. Include YHS in your planned giving: Attend a free YHS Planned Giving Seminar on Aug. 1 at the Prescott Lakes Country Club at 7:30 a.m. A complimentary deluxe breakfast will be provided. The seminar is entitled “Reduce Taxes and Save Lives: Tax Reduction and Planned Giving Strategies.